Good Heavens is in his element, here. and happy holidays to you! OH YEAH I FORGOT TO SAY HAPPY HOLIDAYS!! Happy Holidays to you toooo!!!! awwww!! i’m loving the use of bright colors! so cute! I think it’s a nice change, but I say wait until you get further into the comic. Maybe if your going to do covers, use this style for it to really grab people’s attention? Or when you are going to do day scenes, and at night ones make it the original art that you where starting with? I wish Goody would come and sort out my life. Penny’s Soda Shoppe. There is no point in reading the other two brochures. Fantastic art. Quick note: Helvetica lives in T6 not C6. good comic, enjoying so far. only question is why did you make goodheavens and helvetica look so similar. it distracts me from the story when i have to figure out which one is talking since they look the same. do skeletons have bone noses or not? Dont you want to go to 9th heaven in a sports car? or the number 9? 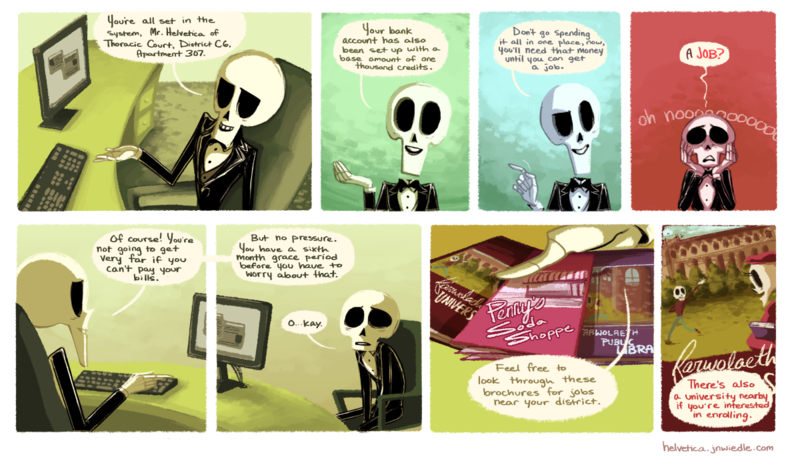 ah, skeleton capitalism /does/ exist! How horrible neither in you can’t scape responsabilities! You can spend the money in things you like! SCORE!! !